Silky oak (Grevillea robusta) belongs to the family Proteaceae. 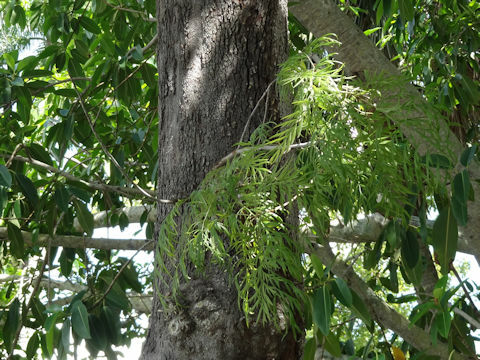 It is a tall evergreen tree that is native to eastern coastal Australia. 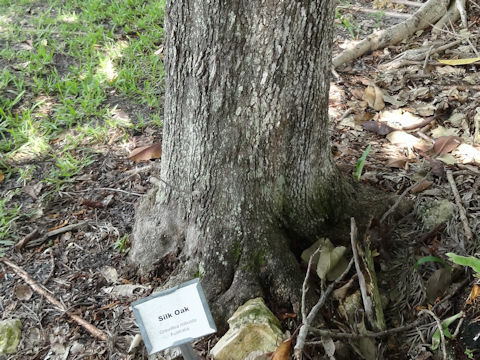 This tree grows in riverine, subtropical and dry rainforest, and up to a height of 5-40 m. The bark is dark gray and furrowed. The leaves are fern-like, divided into 11-31 main lobes. Each lobe is sometimes further divided into as many as four, each one linear to narrow triangular in shape. It loses many of its leaves just before flowering. The flowers are yellowish orange, or sometimes reddish, "toothbrush"-like, and bloom from September to November. The fruit is a glabrous follicle.